What a trip to the Paiute Trail! We escaped the summer heat of Phoenix for a wonderful adventure on the Paiute Trail in the Utah mountains. 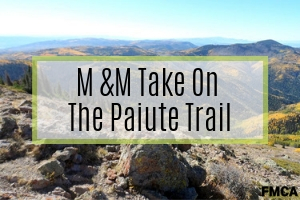 The Paiute Trail is an all-terrain vehicle (ATV) trail system in southwest Utah with more than 2,000 miles to explore. We stayed five days and easily could have stayed longer. 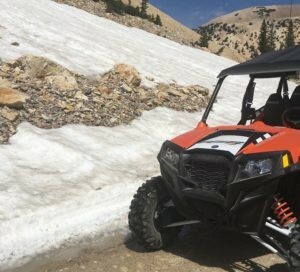 Each day we traveled more than 100 miles through some amazing terrain, even playing in the snow at 11,500 feet. Our drive sure was a pretty one. Marysvale is an hour or so north of Bryce Canyon National Park on U.S. 89. We traveled through the cool pines of Flagstaff up to Lake Powell for the night. 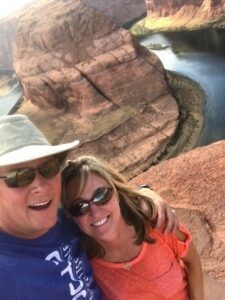 A highlight for me was a stop on the left side of the road at the famous Horseshoe Bend. Mark doesn’t like to stop on the left ever, so for him to do it in the motorhome while towing a 24-foot trailer was huge. Horseshoe Bend is on the southern outskirts of the town of Page — maybe two miles from the developed edge of town. 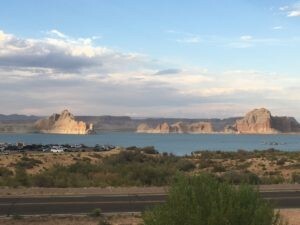 I can’t believe we’ve gone to Lake Powell dozens of times and never knew it was that close. 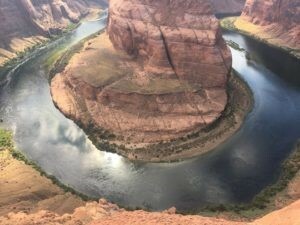 We’ve all seen pictures of the giant bend in the Colorado River, but, holy cow, seeing it in person was something else. So much beauty and color. I bet watching a sunrise or sunset is spectacular. It was a hot day — 105 degrees when we pulled into the little parking lot. The 1.5-mile long trail is sandy, so make sure you wear good shoes. There’s something about the red rocks, they are just so pretty. It sure felt weird to be at Lake Powell without the boat. We took a long walk through the campground after dinner, and we saw all the sun-kissed families hanging out while towels dried on any space available alongside their boats. The families reminded me of our many fun trips there. It’s time to go back. The next morning was rather leisurely for us; I think I like this “no alarm clock” thing. We drove through the little town of Kanab and several small towns and farms along U.S. 89 into Marysvale. U.S. 89 is a scenic drive just over the mountain east of I-15. Marysvale sits at 5,863 feet, which makes for nice, cool nights even in July. No alarm clocks on this trip! We headed out every morning loaded with lunch, snacks, and plenty of water. The trails were easy to access right from our campground. Mark talked to Jim, the campground owner, every morning for trail information. Jim highlighted the best trail for us, as well as gave us helpful tips. This was a huge bonus and one of the reasons we will go back. Jim knows the trail system well. We played in the snow in July! We were above the tree line at 11,500 feet. There were a few really big patches of snow left and we took full advantage. A few snowballs were thrown, as well as a couple of snow angels created. There was one big patch that covered the trail. Oh, we had fun blasting through that. The wildflowers were out in full force, and we saw more butterflies than we could count. After playing in the snow, we traveled down the other side of the mountain through a ski area and several little lakes (or big ponds). 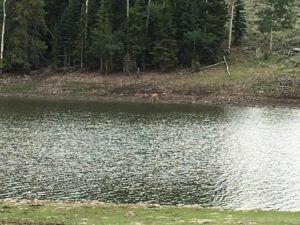 Deer sightings were commonplace. We led the trail rides, and I had my eyes peeled for animals. A quick “Deer!” call from me led Mark to a quick stop as quietly as possible. Luckily, Keith, Mark’s cousin, and his wife Linda were directly behind us most of the rides, so if I missed the picture, she did a great job getting it. We climbed until there was a nice clearing with several deer. Time to stop and take pictures! They almost posed for us. They would walk away, and then stop and turn their heads around to see what we were doing. Our first day also had some misadventure; which is always more fun. We found one of the two maps we were juggling was better than the other. We abandoned the less helpful map and fully committed to the first map. As with all map reading, you know you are at one point when, in fact, you are way, way off. At some point, we turned right instead of left, only we didn’t realize it for several miles. The map showed a trail on the left down the path. Sure, the trail is there…and only 50-inches wide! Our RZRs were too wide to navigate down the trail. 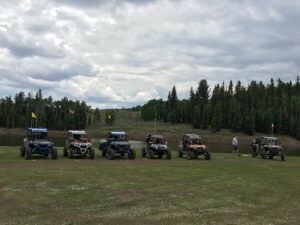 All trails on the map were marked as to what size UTV would fit. 50-inch wide trails were clearly marked. We assumed it would be the same on the next trail, but we were wrong. To correct our mistake, we went on for a few miles until we found a turn-out for a map check. We had a good enough signal to pinpoint exactly where we were on the road, and we realized we should have turned left when we hit the highway. Thankfully, this highway was nice and quiet with only a few cars. Off we went on the correct trail to more adventure and some lunch! Our loop trail was taking us to the town of Circleville, south of Marysvale. We started down the trail as it went down the mountain and were greeted with a series of switchbacks. Fun for us in a 2-seater. Not so much for the three 4-seaters in our group. 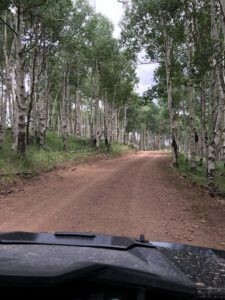 We stopped at another clearing, and, when everyone joined us, it was an animated description of their wild ride down: “I knew you wouldn’t take us anywhere dangerous, Mark, but man, I had to three-point most of those turns,” they said. We had lots of laughs the rest of the trip with the request of no more switchbacks. Not far from the campground is the Bullion Canyon & Miners Park Recreation Trail. It was another beautiful trail; the trees hung low and we crisscrossed a flowing creek. We passed signs about the mines, but we didn’t pay much attention to them until we stopped at an area large enough to park our RZRs. Here we found the Bully Boy Mine. 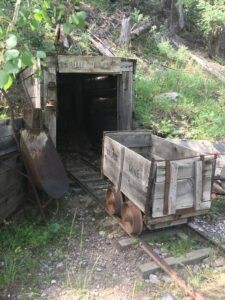 We had a teacher in our group, so she decided to do a unit on the mines right then and there. She carefully photographed the entire scene and typed notes into her phone (Sorry, no pen and paper in the RZR.). This was one of those great little gems we love to find on trail rides. 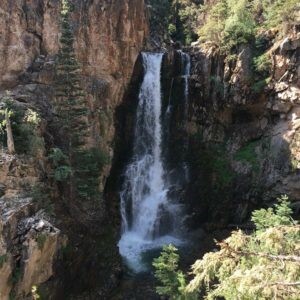 The waterfalls, oh, the waterfalls… These weren’t huge like Yosemite’s (Check out our post about exploring Yosemite’s falls. ), but they were beautiful nonetheless. On our last day at the Paiute Trail, Mark told Jim we wanted to see waterfalls and he did not disappoint. We went in and out of several canyons. 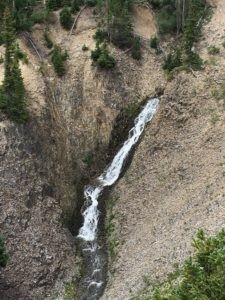 You would think that the waterfalls at the back of the canyons would be similar to the ones in the front because they have similar terrain and exposure. No, they were all so different. One looked like it was coming straight out of a hole in the rock. Another cascaded gently over rocks while another streamed almost straight down, bouncing off the rocks far below. Our time on the Paiute Trail was not long enough, but alas, it was time to go. Two in our group headed home to California while the rest of us headed down to Bryce Canyon for a few days. More adventure awaits! your story has totally inspired us. 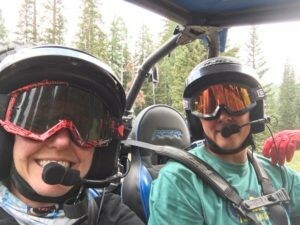 We live in Alaska and now are planning a trip to those atv trails in Utah ! Thank you. I wish I would have seen your blog BEFORE we travelled to Bryce Canyon. I think our group would have had an amazing time. 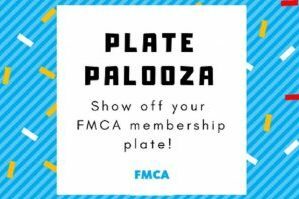 Now you’ll have to plan a second trip there!